You can always expect a good time with us at Skate Moore, and with our extra summer hours, the good times can go ever longer! From now until the end of summer, we’re opening early on Thursdays. 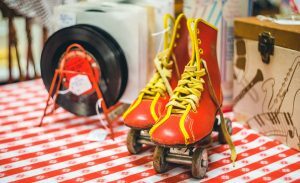 From 12 p.m.-3 p.m., you and your kids can fight summer boredom with three hours of skating, concessions, arcade games and more for only $5! Everybody loves summer, but let’s face it… sometimes it can get boring. Instead of parking your kids in front of the TV all day, why not bring them down to Skate Moore for a fun, exercise-filled afternoon? We’ll be offering Child Care Groups every Thursday for the rest of the summer! This a great way to keep your kids active through the dog days of summer at an affordable price. Admission to the rink is only $5 and if you book in advance, each kids will get a free small drink. You can also add pizza for the group for small extra charge of $1.50 per child. Our Child Care Groups are perfect for parties of ten or more and are certain to provide hours of fun for everyone involved. We have an awesome snack bar to keep your kids fueled up and ready to roll all day! Roller skating is an excellent form of exercise and burns up to 600 calories per hour. Our concessions are designed to refill the tank after your kids burn off all that pent up summer energy. We also have a world-class pro shop where you and your little ones can get all the latest gear. From skates and wheels to pads and more, our skate gear is top of the line and can have your group rolling like the pros. Roller skating is a timeless classic that is sure to provide tons of fun and lasting memories for everyone at the rink. For more information about our summer hours, group rates or party bookings, give us a call at Skate Moore in Moore, Oklahoma, today!